Now that my blog is titled Aunie SAUCE, I feel it's appropriate to sauce-it-up and let you know how I feel about a couple things. 'Cause saucy people are outspoken, sometimes cheeky, and a little defiant, right? I will ALWAYS swap. Always. If by some chance this blog grows exponentially and I'm able to charge $500 per ad space, I will still swap if the person has a similar following to myself. Swapping is important. It helps get bloggers out there who may not have the money to pay for a crazy-expensive sponsorship, it's a great way to get YOUR name on THEIR blog for free, it adds another backlink to your site which boosts your internet search ratings, and it is FUN! Not everyone should have to pay to spread the word about their blog. I'm a little different than some bloggers when it comes to timelines. I'm not ONLY going to let you swap me for one month and then take you down the next. I swap whenever and for however long you will swap with me. It's as easy as that. If you want to swap until 2063, let's do it, girlfriend! I don't limit swappers. Some will only feature 5-10 to get you "maximum exposure"... but I think that any kind of a swap is good exposure so bring them on! Plus, I rotate my swap ads, so you're always getting exposure, trust me. Just the other day I saw my boyfriend's mom clicking through each of my swappers. Trust me... just by swapping you're getting your name out there. Getting ME to come and read YOUR blog. If you want ME to read YOUR blog... comment! In fact, some of my favorite blogs are from the people who comment on my posts the most. For instance, Chloe, Kristen, Lily, Cat and Jessica (there are more, too and I love each of you!) comment on almost every single one of my posts. I read their blogs each and every day. Want to know why? Because they comment. I built a relationship with them. My fondness for them translated into me wanting to visit their blogs every day to see what they have going on. Commenting-- not comment spamming-- will get people to read your blog. Go to your blogger profile. Check the box that says "Show My Email Address." Voila-- I'll get directly back to YOU. Easy right? If it doesn't make sense, just check out this little tutorial. And... I think that's all for one day. I may have to come back and make another post if I think of more to gush about. You can take my advice, or don't... but either way, I hope you have a fabulous day! I really really like it when bloggers blog about blogging (is that a tongue twister or what?) so this post made me really happy. And I agree. Although I kinda get why some people limit their sponsors, just because I don't want my sidebar to be 5 miles long, but I don't have that issue yet. But you go girl, I think swapping is awesome! And I wish there was a great big banner when you log into blogger that says "SHOW YOUR E-MAIL: THIS WAY" and somehow magically took everyone to that not-so-well-known page in blogger that allows you to actually connect with people. Ha! amen, sista! i read your blog on the regular - bu i don't comment. it's very rare i comment on anyone's at all. but that's moreso because i know how i am... and once i start commenting, i can't shut up. so then i end up writing a novel - kinda like what i'm in the process of doing now... just to explain why i don't by simply illustrating the exact same thing. smh... ahah. it's a lose/lose. plus, i don't comment because by the time i read a post - everything i would've wanted to say, would have already been said. ya know? btw, my name is dorothy. hi :) ahah. WELL SAID about the swapping! I'm definitely in the same mindset about it as you! I don't think I could charge someone to put some pixels on my blog for a month, but that's just me. It's SO TRUE. Being a new public blogger, I'm just trying to add good content to my Bloglovin' reading list, but I'm already getting comments that really have nothing to do with what I wrote and EVERYTHING to do with getting me to visit another blog. All I think is, "Well, that's no fair. Did you even read my post?" And then I don't visit the other blog. ;-) Sorry, that's just how it is! I don't care if it takes me one year to reach 100 followers/reader; I'm not going to spam every bloggers comment wall to "get myself out there." Love this post. I agree with all of it! Thanks for answering my question (and some) about swapping! You are too funny ... swapping until 2063... friends fo LIFE!! 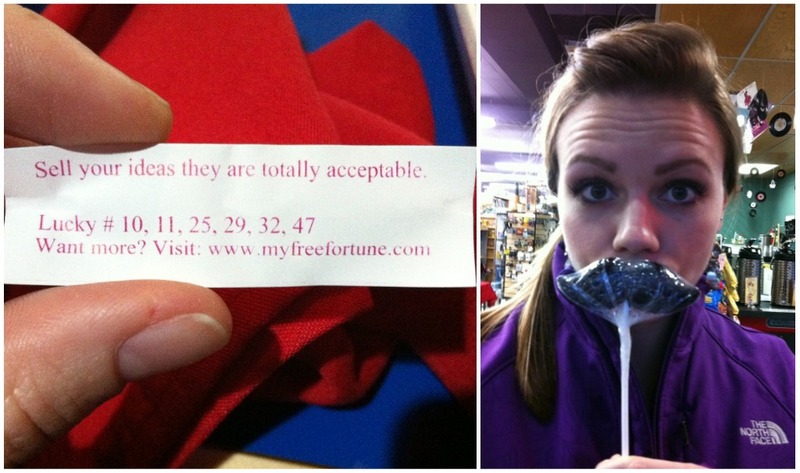 Love that fortune cookie! Amen! I don't like it when people say come check out my blog or I'm following you will you follow me back. Just poor form! I want people to follow my blog because they legitimately want to read what I've written and are interested. I like what Lindsay said! Great post. You are so right about the follow me bc i followed you thing. Well what if I am not into what you blog about? I love that you are so open to swapping. I think swapping is great for new people to spread their name around and get to know other bloggers. I love this post because I 100% agree with you. Being a poor college student, it was really hard to get my name out there initially. I sincerely appreciated other bloggers and yourself for giving me a chance. And now I have almost 90 followers! It's just a great way to network and create relationships. As for the comments. Comment spam pisses me off. I want people to our links to their blog so I CAN visit, but don't TELL me to visit your blog. It makes me not want to. So, there's my thoughts. Haha. yes I seriously hate when people say "now come to my blog at www.." It makes me think they only commented so that I will go to there blog. Not because of the content of my post. I've had some do it repeatedly if I don't follow them. Anyways, i appreciate your honesty! good points, I like your swapping policy. WHen I was starting out blogging you really helped me by swapping, so thanks for that. Thanks for the tips! I started blogging a few months ago and have recently been thinking of making my blog more public and trying to get more readers. I really appreciate your insight as a more experienced blogger. Nothing wrong with being out spoken! Swapping is always wonderful and comments are always great!!! You were the first person that swapped with me when I began in January. Therefore, you have the biggest button at the top of my blog! Thank you! "Come follow me, I will follow back"
No! That is not okay (haha) if you like my blog you can follow and I would love to check out yours as well. I'm not in the business for fair weather followers. Right on sista. Swapping really helped my blog grow, but at the same time it has it can start to take up a ton of room and time if it gets out of hand. I can see why people limit the number, jus sayin. I love what you say about commenting- I wish everyone that read left a comment! It wasn't until I started reaching out and letting people know I was there that I started to feel like a part of the community. Some of my favorite commenters still don't know about the "show email address" it DRIVES ME NUTS! I agree completely with everything you said!! Commenting is the one thing that gets me! I wish everyone would comment! I find more blogs that way too!!! I agree with all of these! I get so bummed when I go to reply to someone's comment only to discover that I can't. Some of my other bloggy peeves: music. I usually have 10+ tabs open and get so mad when music starts playing and I don't know which one it's on. Oh and the swappers thing, that is seriously good to hear! I get so bummed when people charge an arm and a leg for a tiny little spot. I mean, i know they're good sized bloggers but still.... some I've seen are just outrageous! Thanks for the post! I always love to hear blogger's insight on blogging. It makes me learn so much more! Plus, it gets me motivated and moving to improve my own blogging (etiquette or otherwise). Thank you! I like this. Now come visit my blog. Just kidding! I just recently started participating in some 'swapping'. I have really noticed a difference in the number of visitors. From this I have been introduced to a lot of great blogs and the bloggers behind the blog and have made some new bloggy friends. I am all for swapping and I am happy to hear you say you're into it. I agree with everything this post says! I hate getting an email that says I got a comment and reading that comment and all it says is "nice post follow me at somethingIprobablywontlookat.com"
I think I know what swapping is. When i saw the title of that section I was like 'what's swapping' but I get it now. And I love finding new blogs through you, I figure if you like it then I probably will too. People with www.comeandseemyblog.com annoy me so much. If there's ever a way to make me not come to your blog thats the way to do. Very well said. Each and every blogger should read this and take your advice woman! This is the best advice ever! I love how outspoken and real this post is. I totally agree with blog swapping. Not that I am a popular blog by any means, but i want to do blog swapping forever. We all start at 0 followers (or one cause I know I follow my own blog haha) so why not help each other out and get each others blogs out there? It's a blogging community and we should all stick together, that's what I think anyways! I hope you do write a part 2. I love that you're real, honest and share your opinion. I think swapping is great- I need to start doing it with other bloggers b/c it is hard to get exposure. Great post! I love the part about swapping, which I am going to be implementing on my blog very soon. I also love that you wrote tips for the average personal blogger. Personal bloggers tend to get left out in the cold when it comes to valuable blogging tips, so thanks!